Amazon announced its plans to launch a new drone delivery service this past December. Recent eye-popping acquisitions of robotics technology companies by giants like Google and Amazon might suggest that the automated age is upon us. Is it? Why now? Are these the companies that will usher in the commercial robotics and drone era? And will the little guy continue to find a place in the new epoch? While the excitement surrounding all of this suggests that a huge movement is afoot, those in the community should be relieved that we are finally seeing any activity. The investment situation in robotics has been abysmal for years, and the affirmation of momentum is real and inspiring. The investment situation in robotics has been abysmal for years, and the affirmation of momentum is real and inspiring. The natural perception is that the movement is real, but the market has much to prove. Of course robotics has a place in the future, but modern history has seen the bulk of activity within academia and professors chasing the next grant. However, big companies positioning long term for the inevitable opportunity is far from unprecedented. For instance, as far back as 1998, Honda shocked the world by demonstrating ASIMO, a robot capable of advanced gait, climbing stairs, communicating, and more … with limited revenue positioning whatsoever. Seeking examples of large companies that have invested in robotics infrastructure is easy – look no further than KUKA, Yaskawa, FUNUC, Rethink, Sony, and Intuitive. The massive payoff for many of these investments has yet to arrive. Understanding the emerging market opportunity is sci-fi easy. Recognizing when the market will hit is not. Perhaps that gives insight in the state of affairs at Google and Amazon with multiple robotics and drone acquisitions in the recent years. Understanding the emerging market opportunity is sci-fi easy. Recognizing when the market will hit is not, especially when so many companies have yet to capitalize despite decades of huge R&D costs. Recent acquisitions are coming from capital rich companies, and these companies are primed to build the infrastructure required and wait this lucrative market out. Google’s investment in Boston Dynamics has this quality. Amazon’s investment in Kiva had a dramatic infrastructure feel. A year straight of negative privacy press was diluted when Amazon suggested a very tangible and real use of drones that the average person could digest. While I am hesitant to say that the robotics and drone commercial markets will affect the average person’s day-to-day activity tomorrow despite the renewed activity, the feel now is that the climate has noticeably improved for adoption. 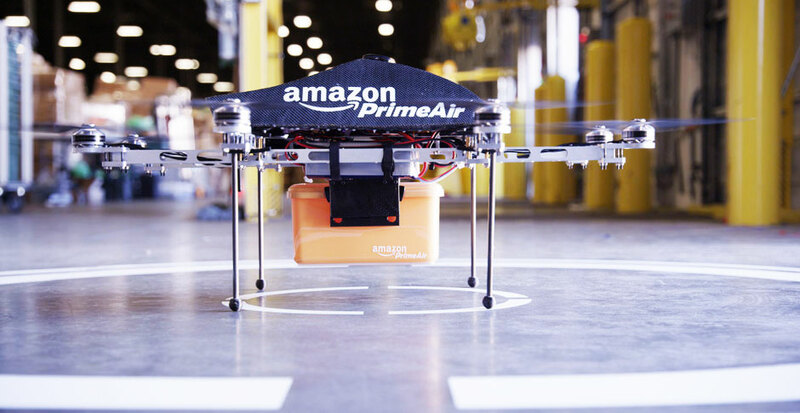 For instance, in the commercial drone sector, Amazon provided a great community service with its 60 Minutes showcase highlighting its proposed Prime Air delivery service. A year straight of negative privacy press was diluted when Amazon suggested a very tangible and real use of drones that the average person could digest – one that comes with a huge economic upside. While Amazon suggested they could have the system up in 3 – 4 years, I think most of us in the community expect a much more modest timeline. However, the good that came from the announcement has the community buzzing again after a relatively stagnant period of waiting for the air space for commercial drones to open. The last year of robotics activity seems to be in lock step with this changing drone perception. Even if the tipping point for the commercial market for robotics and drones may yet take some time to arrive, the advancement to this moment is noticeably accelerated. For ubiquitous application, robotics and drones require significant infrastructure when considering use alongside people and existing systems. Rather than thinking that the big players are going to squeeze out the little ones, I expect the opposite. Little has done more for the community then the evolution of layered robotics operating systems, SDKs, and applications that have contributed to the powerful offering available to the community so dependent on infrastructure and smart solutions. Sensors are also at the price point where robotics and drone systems can be competitively priced. Seemingly, the prerequisite ingredients for adoption have arrived, and companies recognize this. Perhaps this is another major reason that we are starting up the proverbial curve. Rather than thinking that the big players are going to squeeze out the little ones, I expect the opposite. With so much infrastructure and so many markets soon to seek robotic and drone technology, the corporate acquisitions are probably just starting. Prospects are great for the small business providing a part of the overall solution. Positioning an offering in this community makes sense. Much change and adoption is ahead, and this will take time. But the time is probably right to get in if you are going to and have your offering be relevant when it counts. In essence, the window is not completely wide open for commercial robotics and drones markets, but it is opening. And like anything, you need to get there early. I think the 5 AM alarm is going off.